If you want to see lavender in France you must come in July. Fields and fields, with rows and rows of lavender. The scent alone will send you into la la land. The lavender fields are in the south of France, some of the best or largest are in Valensole. Plenty of activities, festivals, classes, and such surround the lavender fields in July. For maps, routes and the best lavender fields around check out the tourist offices in Provence. French Husband and I went for a Sunday drive. After lunch (Grand Cafe) in Valensole with our tastebuds satisfied and a map in hand we took to the back dirt roads to find "The Spot", as I kept calling it. I wanted to find a field that had lavender and sunflowers side by side, or lavender and fennel side by side, and an old ruin too. "The Spot" kept us stopping every two seconds, with me saying, "Oh my God, look at that one! Stop the car! Oh Yann look!" and French Husband getting in and out of the car saying, "I could live here, I love the space." Valensole is on a plateau, the view is incredible with the French Alps in the distance. Purple and Gold where my high school colors. Flavorable memories bring joy. Maybe that is one of the reasons Provence feels like home. The other day when we were out and about in Valensole, I posted photos with my iPhone. When we came to these fields I pulled out my "real" camera for some eye candy lick it up happiness. Lavender and sunflowers, I could have picked five thousand bouquets, and not have made a dent. Being a Farmer's daughter, I didn't pick one, crops are someone's investment. Though I saw many people picking lavender, I wanted to tell them to stop it, and buy a bouquet at one of the many nearby stands. Millions of busy bees buzzed. They didn't bother us, because the lavender had what they wanted. Though if you are allergic to bees, you might not want to go to the Lavender fields when the buds are in bloom. In some of the photos I took, when I enlarged them I could see dots, bees, swarming. Several years ago a drought destroyed many of the lavender fields. The newest threat is an insect called: Cicadelle. As lavender is grown naturally without chemicals, farmers are hoping by adding a clay mask to the fields, to help the production next year. "The cicadelle first put in an unwelcome appearance in 1994. Since then lavender production in Provence has dropped dramatically - in 2011, it was just one-third of production in 2000...."
When a lavender crop is destroyed it takes three years before full production. We saw many new fields of lavender, since the plants were small these fields were hand cut. Imagine how romantic it would be to ride a bicycle through the French countryside. Maybe not on this bicycle. An old tractor that was used to harvesting lavender. The two blades on other side of the lavender (already cut in the photo) cut the long lavender stalks, then the lavender stalk winds up the curly arms (see in photo), to the top and are automatically wrapped with twine and dropped out the left side. Lavender has essential oil and fragrance in the stalk too. Roland and Jenny De Cordier-Voet have a lovely photogenic shop smack dap in the middle of lavender country, route de Riez. Lavender sachets using old fabric. Where to buy Lavender bottles. photo source and place to stay in France countryside. Do you want to stay in a little French cabin in the middle of nowhere surrounded lavender? 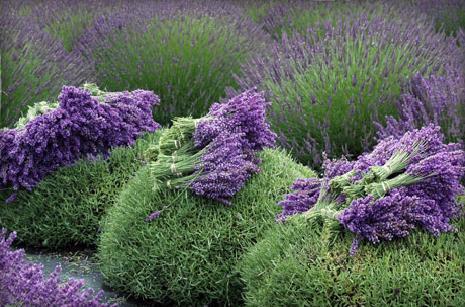 photo source: How to harvest and dry lavender.